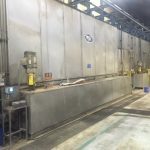 The pretreatment washer is considered the most important part of the coating process in order to achieve a desirable and long-lasting finish. 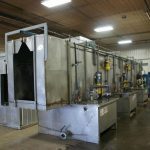 At AIS, our focus is on building long-lasting, stainless steel washers that will maintain peak performance and will always look good. 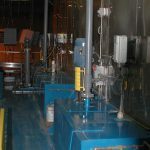 A poly or steel washer have a limited lifespan and will lose performance and aesthetic appearance over time. 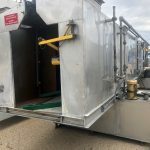 With our custom designed canopy assembly we eliminate upper-housing warping resulting from over-welding seams and also are able to offer faster delivery times. 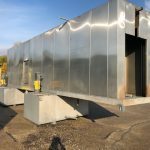 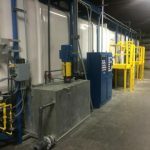 We will provide you with the correct washer design to include; number of stages, heating systems, drain-zone lengths, halo and counter-flowing rinses, and spray or immersion tanks to meet your requirements. 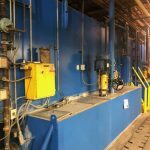 Steel or SS Gusher pumps, Maxon burners, Fiberglass skid resistant grating, Bex nozzles, UniSpray quick-disconnects, and PVC and CPVC piping components are our standard; however we can integrate components from your chosen vendor or material. 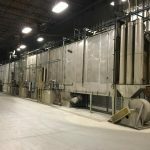 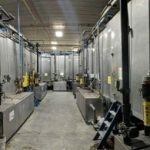 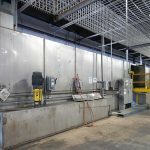 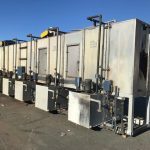 Additional options that may be included are: pump vfd’s, insulated tanks and housings, waste water treatment systems, reverse osmosis systems, evaporators, and oil skimmers. 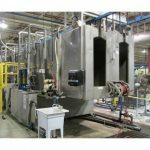 W-137 3-Stage Stainless Steel Washer, 42" x 84"